Short biography of Father Xavier: he was born in Geneva on September 29th 1942, ordained as Catholic priest in the Diocese of Lausanne, Geneva and Fribourg. His activities as priest and educator took him from Plainpalais in Geneva to Peru. At first he worked in the Altiplano near Puno, then in the Amazonian forest of Madre de Dios. Since 1996 he lives in Puerto Maldonado where he built up the Centre of San Vincente and the Apronia Association. “Apronia” (Association for the Protection of Children and Adolescents) is a legal entity whose objective is to help children and adolescents in difficult circumstances. In order to cover administrative costs, it is linked to the Parish of San Vincente of the “Vicariato Apostólico de Puerto Maldonado” and registered as No 0048. The Association collaborates closely with the judge in charge of families and the “Defensoría Municipal” for children and adolescents (DEMUNA). “Solidarity” is no empty word for us, is it a living reality where North and South can meet through our constant commitment and also thanks to the visits of friends and volunteers, the hard work of around 65 employees and supporters of Apronia Peru and Apronia Switzerland and through sharing resources: it is like life blood circulating between our two continents. The Association was set up in 2005 by a group of close friends of Xavier Arbex with a view to supporting his work with children and adolescents of Puerto Maldeonado. The help of a very generous donor enabled Apronia Switzerland to develop its activities thus establishing a partnership with Apronia-Peru. The objective of Apronia-Switzerland is to sponsor the Peruvian Association, to inform Switzerland about the needs of the children of Maldonado through promoting any activity to help and support them. It collects funds to pursue the development of the project leading to true autonomy of the Peruvian Association. Spending a few days at the Principito Welcome Centre is like gathering children’s laughter, images of their happiness in a family atmosphere where everyone finds their rightful place. 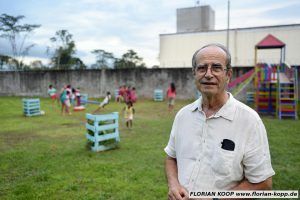 To enable this haven of peace to exist in a violent surrounding, Father Xavier insists on the need for a Swiss partner association to finance, but also to support and advise this small miracle of the Peruvian Association and helping It towards autonomy. Apronia has strong links with a French humanitarian Association “An Orphanage in Amazonia” a group of IUT students in Engineering of Nîmes who took responsibility for building the Welcome Centre Principito. A Video produced in 2012, presenting the Centres and the three business ventures.